You direct it. We create it. Your guests receive perfect LDS wedding invitations. When you’re Mormon, wedding season feels like it is year round. Probably because it is! It seems like every week you have friends getting married or engaged. Your refrigerator is constantly covered with smiling and kissing couples on their LDS Wedding Invitations. Well now you’re about to be one of them- Congratulations! With so many Mormon weddings it is important to make sure that yours stands out. One of the best ways to do that is through your wedding invitations. It is the first thing people will see and remember about your special day. No one wants a boring wedding announcement designed for the masses. And you definitely don’t want to have the same wedding invitation as anyone else on your guests’ refrigerator. The person who designs your wedding invitations should understand you and your partner’s personal story and style, and who knows your story better than you. 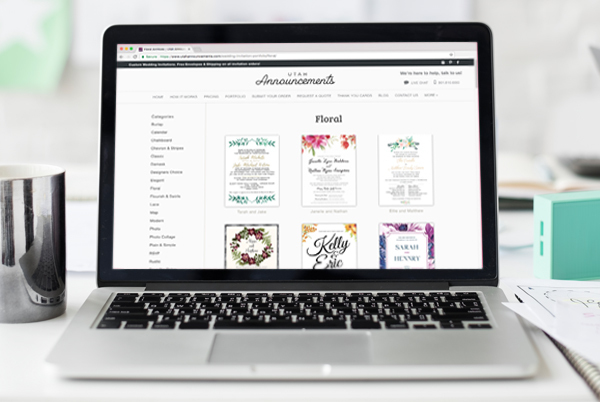 Utah Announcements allows you to be the designer of your perfect LDS wedding invitations. All wedding invitations are completely customizable making your LDS wedding invitations as unique as you are. We help to create designs to match your wedding theme, colors, and personal style. Utah Announcements employs highly qualified and experienced designers that will create or recreate aspects of any design. If you are unsure of what you want get inspiration from other wedding invitations you’ve seen. We’re sure you’ve seen a ton! Our incredible designers will look at all of your ideas and help you create your ideal LDS wedding invitations. 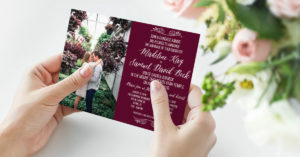 With your completely unique and personalized design your wedding invitations will stand out among the rest of the LDS wedding invitations.